General. Hulst claims to be the most Flemish town of the Netherlands and this is not only due to the fact that it's located near the Belgian border. During the Middle Ages, the town used to be a part of the County of Flanders and still a lot of Belgians like to make a short excursion to Hulst during the weekends or holidays. So, don't be surprised if you hear a lot of Flemish on one of the many terraces that you can find on the Market Square or the Nieuwe Bierkaai ("The New Beer Quay"). Hulst is also known as a fortified town; it is one of the few places in the Low Countries that managed to keep its town walls virtually intact. They now make a nice setting for walks and this is greatly appreciated by both inhabitants and visitors. The historic center can be found within these mighty ramparts. Unfortunately there are quite some younger constructions that don't fit so nicely within the historic center. However, don't despair because if you like old architecture then you will certainly love the Steenstraat ("Stone Street") where you can find several old houses with impressive facades. One of the most well-known (or rather one of the most notorious) inhabitants of the region was Reynaert De Vos ("The Fox"). He was the main character of a centuries old animal epos. On various places in the town but also in the surrounding villages you can find monuments and indications to this epic story. History. Traces of habitation have been found in the area that date back to before Christ. 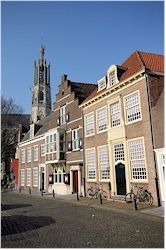 The beginning of the settlement of Hulst itself however should be situated in the 11th century. It received town privileges in 1180 after which the port town was fortified with walls. One of the most important sources of revenue was the production of salt. 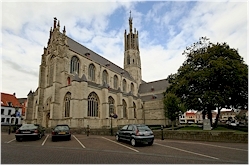 On several locations in the province of Zeeland the salt trade generated great wealth. In a time when refrigerators and freezers did not exist yet, salt was one of the best ways to preserve food for a longer period of time. There was an eager market for the sea salt as an alternative to salt that was extracted from mines. It is for good reason that it is also called the "white gold". Hulst was located in the sphere of influence of Ghent; in the course of the 15th century there were several clashes with the city of Artevelde (Ghent) resulting in the destruction of Hulst. The 80 Years War (1568 - 1648) was crucial in the history of the town. Hulst had an important position in the defense of Antwerp. In order to better protect Antwerp, dikes in the wide area were pierced to flood the countryside. In 1591 Hulst was captured by Prince Maurits of Nassau but the Spanish managed to recapture it. It was only at the very end of that war (in 1645 to be precise), the northern troops managed to expel the Spanish. With the Peace Treaty of Münster, the town was permanently attached to the Northern Netherlands. The current border between the Netherlands and Belgium in this area (Zeeuws-Flanders) still largely dates back to the one determined in 1648. Hulst still had a connection with the (Wester) Scheldt river until the 18th century. 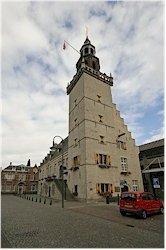 That access however silted up and in 1795 that meant the end of Hulst as a port town. The fortifications around the town were used for a while longer but they were also given up in 1816. While in many other towns, the walls and gates were dismantled, they were (thanks to the efforts of the local population and the town council) maintained here. 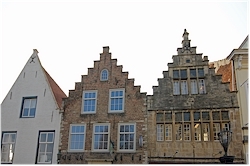 Thanks to this, Hulst is now one of the best preserved fortified towns in the Low Countries. » How to get to Hulst?